I decided that, technically, any one-pass algorithm can be used to compute a running statistic, and one-pass algorithms for computing basic moments are well-known. (In fact, many are implemented in PROC MEANS in SAS!) 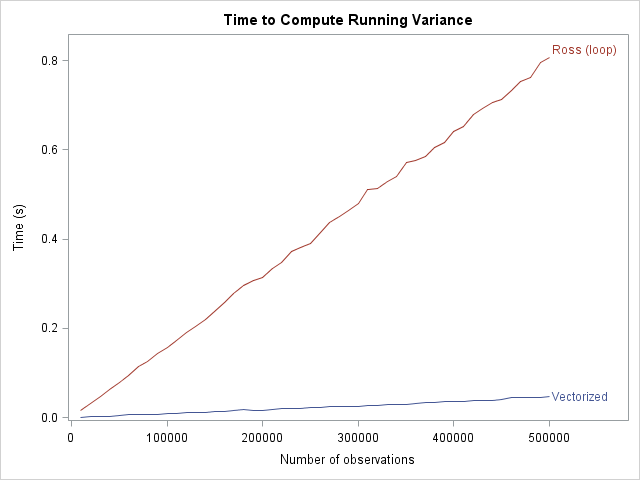 I also remembered seeing a note on John D. Cook's blog about computing a running variance. 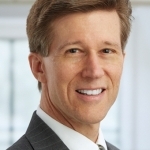 A different formula appears in Sheldon Ross's book, Simulation (p. 116, Eqn 7.6 and 7.7 of the Second Edition), where it is used to monitor the Monte Carlo standard error in order to determine when to halt a simulation. Assume no missing values and assume a row vector. This module serves as a reference in two ways: (1) I know that it computes the correct answer, and (2) I can compare the time required by the "naive" (=slow) module and a future vectorized version. Ross's formula is inside the DO loop. The first recursion relationship (which is commented out) computes the running mean. 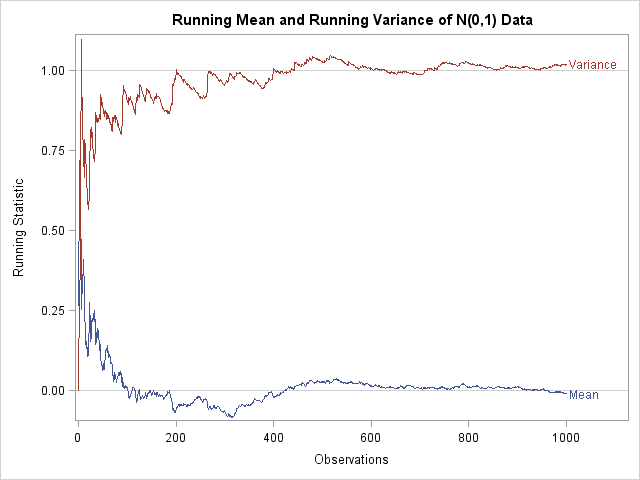 The second relationship, which involves the S variable, computes the running variance in terms of the squared difference between the previous two terms of the running mean. The formula suggests that you can probably compute the vector (M - lag(M,1))##2 and use the cumulative sums of its terms to compute a vectorized formula for the running variance. The LAG function, which is available in SAS/IML 9.22, computes a lagged (shifted) vector. In fact, the quantity M - lag(M,1) can be written more compactly as dif(M,1), which uses the DIF function. The answers are the same for all three methods. I'm excited by this vectorized formula! Perhaps someone else has written it down, but I haven't seen it. If you find another vectorized formula for the running variance, please provide the reference in the comments. Notice that doing a half-million computations in PROC IML is fast (0.8 of a second), so it is not strictly necessary to vectorize this computation. Still, the vectorized algorithm is even faster. The difference in slopes between the two loops is the relative cost of iterating over elements in a DO loop instead of performing a single vector operation. Prior to reading this, I didn't realize recursive codes could be vectorized!! I converted an MLE optimization code which relied on recursion of the form: S(t) = S(t-1)*h(t-1)*exp(a) as a part of the function module, from loop to vector. The optimization time in IML reduced from 160 seconds to 20 seconds! What's better is the fact that the recursion part was done as a loop within a loop, which now, I can completely convert to vector form. This is so beautiful, thank you so much!